In this chapter, I bring together all the information on nibs and discuss their correlations. Let me start with a few general observations. The nib does not care in which way the ink arrives at the slit, from below the nib or the top. In case the nib is attached to a fountain pen, the ink is offered from below, it bulges out of the capillary because it ends there and due to the weight of the hydrostatic column from the top of the ink level in the reservoir to this point, drawing 1. Since the width of the slit is narrower than the capillary. Once the connection is made, the slit’s capillary attraction forces pull the ink into the slit and to the tip. When the nib is attached to a holder, the ink is brought to it by dipping the nib into a well. In regards to photo 1, I would like to draw your attention to the inwards curve of the tines… this reduces the pressure at the start of a line. See pressureless writing in the chapter Nib Mechanics. 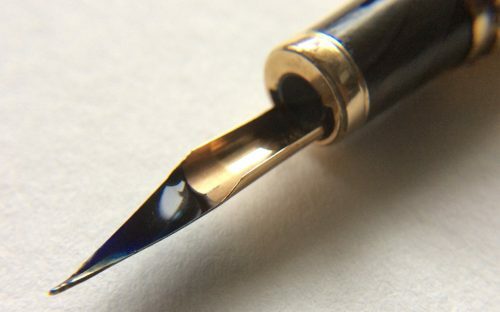 Whatever amount of ink adheres to the nib after dipping is what is available for writing. In photo 2 and photo 3 you can see that the inside of the nib has been roughened. Its main reason is to de-burr the slit and the stamped hole. As a side-effect, the surface reaction between metal and ink changes, more specifically: to increase the contact angle and the adherence of ink. As a refresher, go to Surface Tension. There is no need for this process, a clean tumbled finish is quite adequate. In my early years of writing, I had been fascinated by the Gothic font. The line width varied between half a millimetre to 5 mm (for the hanging capitals at the front of a paragraph), and the ink was used up very quickly. 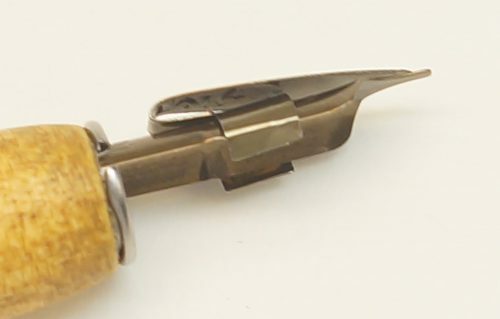 Some nibs for nib holders had a small clip-on reservoir attached to their tops (clip-on for easy cleaning), which was loaded with an eye dropper, similar as shown in photo 4. At its lower end, it had a beak, covering most of the length of the slit. This assured transport of the ink and prevented drying to some degree. The capacity was around three drops, which supplied enough ink for filling a quarter of a page without interruption. I used it for calligraphy where writing five to seven letters, a complete word in one go, was a treat. Photos 5 to 7 show older style nibs. Their method of attachment to a fountain pen is like to a nib holder, they have the shape of a full or partial circle and slide in, photo 6. In photo 5, the shadow lines at A radiating out from the “breather hole” indicate the inwards curvature of the tines; the darker shadows at B show the same. This brings stiffness to the tines, which causes the slit to open straight rather than curved permitting the capillary action to be more efficacious. The softness of writing is encouraged by the flattening across the active cross section, see photo 6. 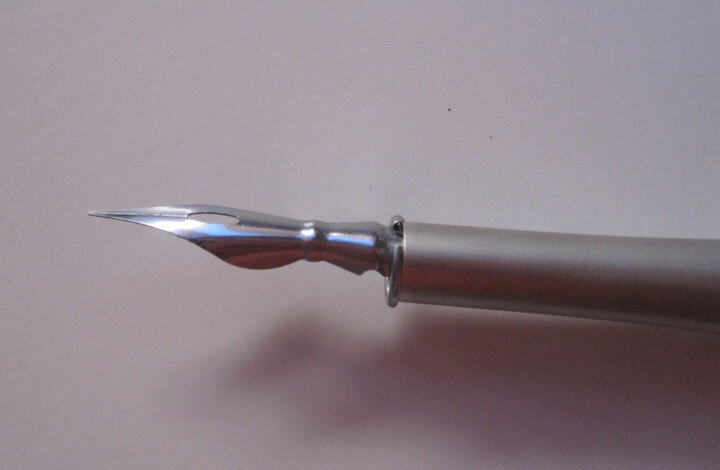 The nib in photo 6 shows a typical flex nib. Characteristic is the narrow distance between the “breather hole” and the outer edge of the nib, which makes it very flexible, together with the thin material and of course the material’s properties. Photo 7 showing the feed from underneath and the flaring out and flattening part of the nib. These are the characteristics of a softer nib. Another example is the nib shown in photo 8 further down, where the tines are almost flat, which should result in a more flexible nib; however, the active cross section (photo 6) ends up in a sharp kink, which counteracts the softening and produces a rather hard nib. 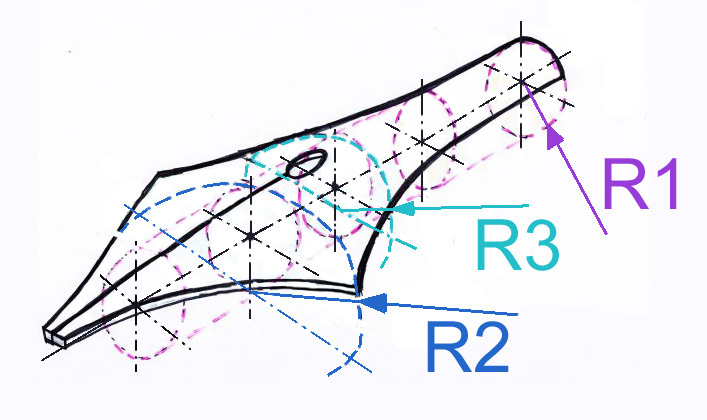 In drawing 2, I show how the nib’s contour changes from a partial circle with a radius R1 to the flatter radius R3. At R1 the profile is circular to slide on top of the round feed into the grip-section. Then, from around the location of the ‘breather-hole’ R3, it starts flaring out towards the tip. The profile continues to flatten further to a circular or oval contour at R2, which significantly determines the softness and responsiveness to pressure. You can see, how, all along its length, the nib rests on a cylinder made from purple circles. The feed may follow this change like in drawing 3 or remain circular. The nib has a larger radius than the feed permits the nib and feed to touch at their capillaries, which helps the ink to cross over. Not all fountain pens use this simple trick. Further down the page, I discuss the various positions for the nib to bend and show, which one is most likely; see diagram 7. I would encourage you to use the toilet-paper-centre-role-nib-model from the chapter on Nib Mechanics and change its radius of curvature. You will find: the smaller the radius, the stiffer. When you gradually increase the radius, there will be a point, when the nib kinks over, with a flip. The next example shows, when designing a nib, the curvature and its change is not merely a matter of aesthetics. This nib is almost flat; see photos 8 a – b. It is not inserted into the grip section but clings onto the feed with two flaps. 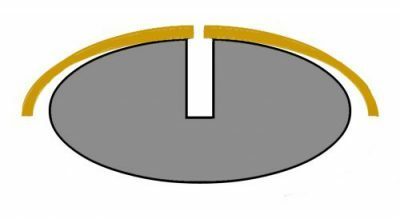 This design with flaps has its advantages during manufacture and in material usage, in particular, gold, when in traditional designs up to half of the material is hidden inside the grip-section. However, there are other drawbacks. When the nib reaches into the grip section, its metal structure determines the stability of the front end of the fountain pen. Whereas, in the above design it solely relies on the strength of the plastic of the feed. Since immediately inside the grip sections, the capillary chambers start, the feed is prone to breaks. I have discussed already why this nib ended up being somewhat stiff; being a nail as some fountain pen enthusiasts call it. Elasticity is the type of deformation where a component to return to its original shape after the deforming load has been removed. If it does not recover completely, then the component has experienced a degree of plastic distortion. In reference to nibs, we want to keep the deformation within the elastic range. If the nib has been designed well, regular writing would not be a challenge. For writing, elasticity is not that much significant, but its consequence of it: the widening of the tines, thus the broadening of the written line. In chapter Nib Mechanics, I explained how the slit widens. Combining this with the information presented in Materials Technology, I will now show, how the responsiveness of the nib to writing pressure can be adjusted. Diagram 4 was the final picture in chapter Nib Mechanics. It demonstrates the necessity of the angle for the tines to move apart at W when the writing force F increases. The larger the angle, the more the widening at the same writing pressure. Now, let us investigate how the dimensions of the wings influence the responsiveness. For a start, let us look at a flat spring attached immovably to something: along the line X – Y. In mechanics, this arrangement is known as the cantilevered beam. You have seen this diagram 5 already in the chapter Nib Mechanics. It shows one of the flat sections in diagram 4. This time let’s add dimensions to it. (In diagram 5 is an artistic oversight. The arrow depicting the force should point to the far end of the length of the flat section.) Being aware of this, we see a standard mechanical ingeneering arrangement, well documented and certified with equations. by the length cubed, meaning: if l would be doubled, 2 cubed is 8. If l is increased to 3, 3 cubed is 27. When applying the same force, d is 27/8 = 3.375 times larger. If you lengthen l to 4, then d increases by factor 8.
by the inverse of the thickness cubed. Let’s say, if you double t, d reduces to an eighth of the original. Applied to the nib, this means: lengthening the slit or increasing the thickness have significant, cubed effects. If you change both by the same proportion, they compensate each other. The length of the slit is not necessarily affecting the length of bending. In the next section, I will look at this aspect, specifically. If you reduce the thickness through hammering, the material becomes work-hardened, and the material’s condition is changed. In order to apply the above, to reduce the thickness, the excess material would need to be machined away, through grinding, for example. What we have discussed so far, will influence the elasticity of the nib, which could be called the softness or hardness of the nib. 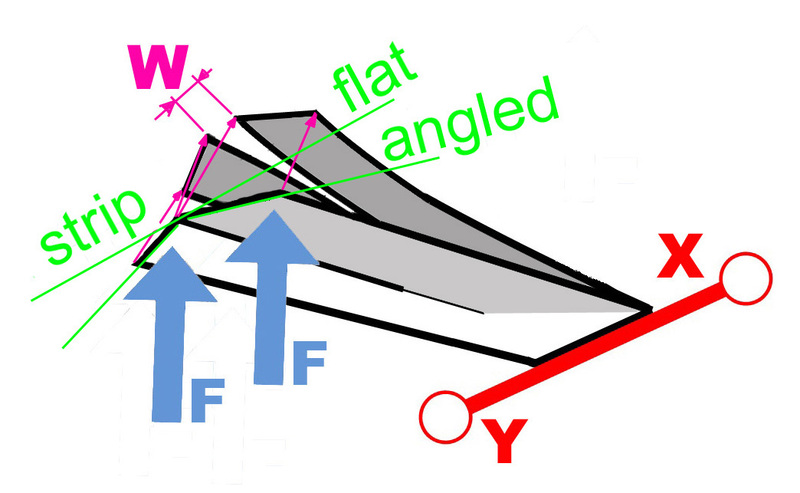 Diagram 4 shows how the deformation widens the slit. 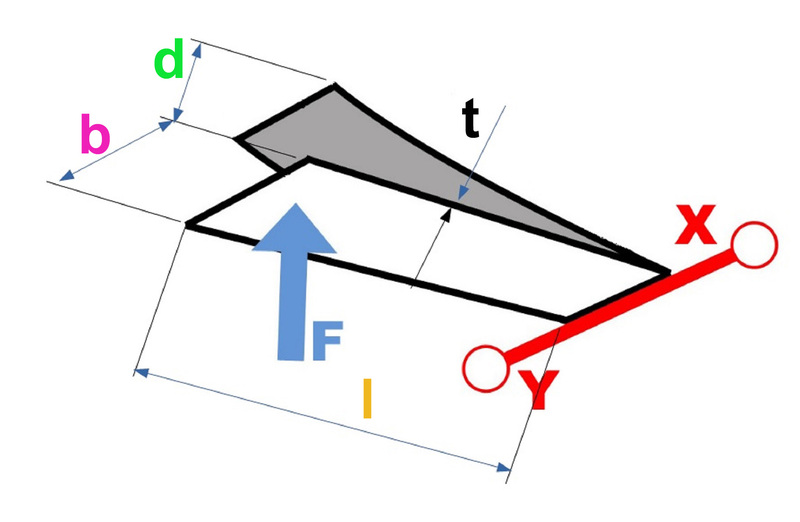 α the angle alpha, the tine is bent along the axis. Let’s discuss equation 2. For example: When α or αF respectively, is 30° then sin 30° is ½ … meaning the widening of the slit W equals the deflection. 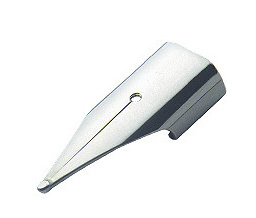 For a rounded nib, the angle αR can be established through approximation. In most cases nibs are not flat roof-shaped, even there is nothing wrong with that. I believe that the reason behind curved nibs is many thousands of years old tradition when nibs were cut from quills, which has turned into a consumer expectation, the icon of writing. A flat nib is more predictable in behaviour. As I said further up, a rounded nib snaps over at a certain point. Not nice. I would not mind a flat nib like Parker had one nut is was stiff as if they didn’t know what they were doing. How to determine the length of bending? It’s a bit like: The chain breaks at its weakest link. They all look the same. How to determine, which one it is? How to predict where the break will happen? In nib terms, we do not want the nib to break, but we want to be able to determine where and by how much the bib is going to bend. The physics of bending I have discussed around diagram 5, we see, the curve is gradual, it isn’t a particular line. As a basis for discussion, you can see in diagram 7 several suggestions for possible areas of bending. As a refresher: Keeping the force constant, the degree of bending is determined by the cross-sectional area, the product of the thickness of the material and the length of the line of bending, which is a, b, c or d.
The width of the bending area is shorter than in suggestion b; however, the radius of curvature is smaller; therefore, this section is stiffer, and bending will not occur. 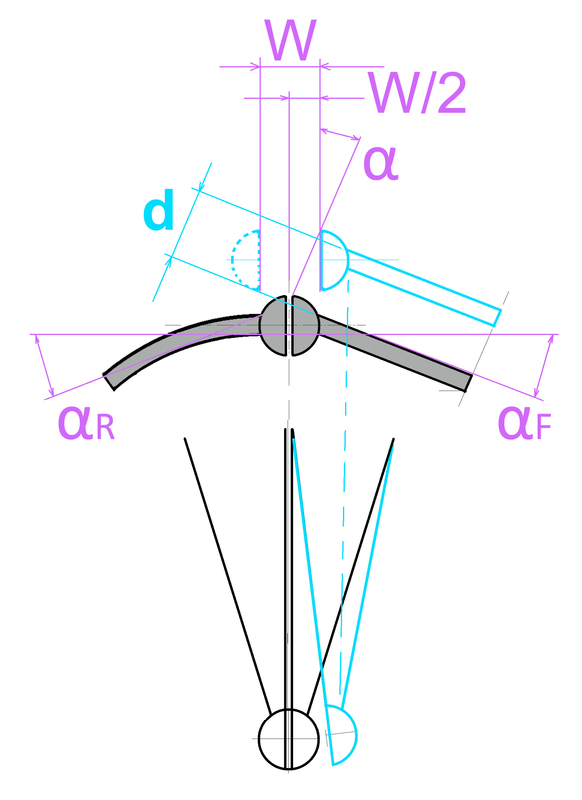 Even it offers the longest length of bending (distance from the tip, therefore longest lever and highest momentum), the width (length of the purple line) is longer than at in suggestion c.
This is the most likely area of bending. In comparison with a and b, it has the largest radius of curvature, and the width is narrower (the green dotted line). 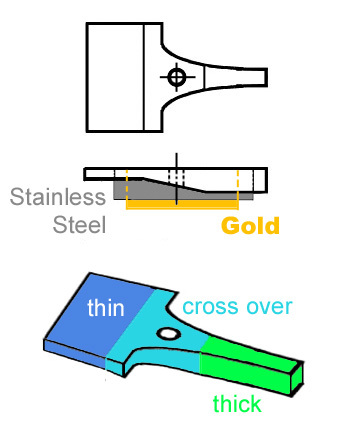 In diagram 8, you can see how the change in thickness and profile can move the bend area c further back, and therefore it increases the length of bending. Why not this one, you ask rightly, the radius is the largest and the width the smallest. Remember, the thickness of the material is often not constant. I show you a diagram from the Nib Manufacturing chapter, which explains it. The thickening has two advantages, at least. It shifts the area of bending further back; the longer the length of bending the more responsive the nib is, see equation 1, the relationship is l cubed. The other advantage is that the slit opening is not curved but straight, through having the thickness about double, which makes this section 8 times stiffer. The same effect is caused by stiffening the tines through bending them inwards as I have shown with the Pelikan nib in photo 5. I feel a sense of saturation. It was a lot to digest for you. Tell me your questions, and I will continue expanding on this topic. Until then, this is the last chapter on nibs, pheeooo, done! This is the last article on nibs. Ready for more? Go to Content and see what’s on offer.